Behind the drywall is the structure, or frame, of the home. The pre-drywall stage is exciting because your home is about one-third complete! At this phase of the building process, several components are installed such as your roof, windows and exterior siding. 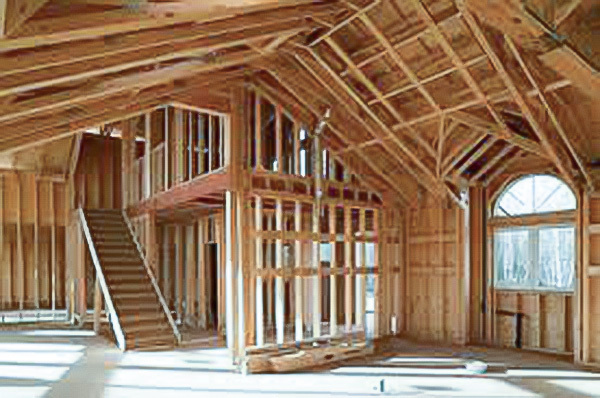 A framing inspection will include the interior and exterior framing, roof and attic, electrical wiring, plumbing and other components installed such as windows and HVAC duct systems. We are code certified inspectors and provide code references that will help when presenting our findings to your builder. There is a complex ballet of contractors involved in the construction of your new home and sometimes oversights occur. When the house is fully built, you are likely only to see the indications of a problem. A pre-drywall inspection is the time to verify the installation of critical components and to find deficiencies while they are easy to correct before they are covered by the drywall. We are not working to point fingers, but rather we want to ensure that your new home starts life in the best condition possible. Framing - anchorage, fireblocking, wall bracing, draft stopping, sheathing, load bearing walls, the foundation system, stud and floor boring/notching. At the end of the inspection, we will review with you any findings, so you will have knowledge of the location of the deficiencies and other pertinent information. You will also receive a digital report with photos and videos (if applicable). Scheduling a quality control inspection with Avid Inspection Services can identify deficiencies in the structure and moisture envelope that can lead to future problems. 10% off Pre-Drywall Inspection and Final Inspection when purchased together. 12% off Pre-Drywall Inspection, Final Inspection and Builder Warranty Inspection when purchased together. Find more interesting information in our KnowledgeBase.